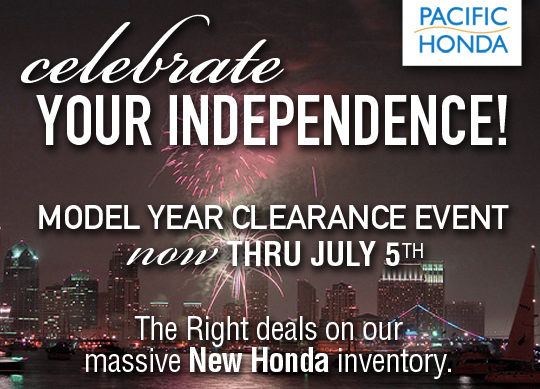 Independence Day Model Year Clearance! Celebrate July 4th in a new Honda! Our Model Year Clearance is going on now. Stop by Pacific Honda to take advantage of these offers. Visit the Honda website for more information on a specific model. 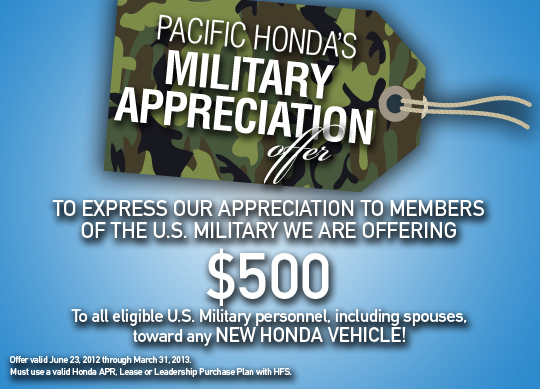 We are very excited to announce the Honda Military Appreciation offer! To express our appreciation to members of the US Military we are offering $500 to all eligible U.S. Military personnel, including spouses, toward any NEW HONDA VEHICLE. See a sales representative for details. Visit Pacific Honda to test drive today! Includes all Active Duty U.S. Military, Active Reserve, Ready Reserve, and spouses. Must use a valid Honda APR, Lease or Leadership Purchase Plan with HFS. Offer valid June 23, 2012 through March 31, 2013. 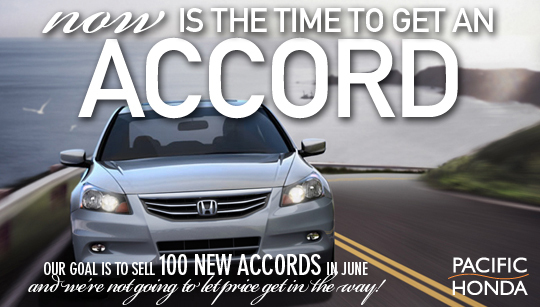 NOW Is The Time To Get An Accord! 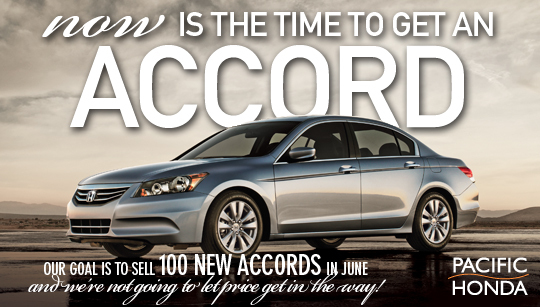 If you've been looking at the Accord and have been waiting to buy, NOW is the time to get an Accord. We have lease specials on most all Accord models starting at just $224 per month (plus tax). Stop by Pacific Honda today to test drive an Accord! Click HERE for more information on the Accord models. 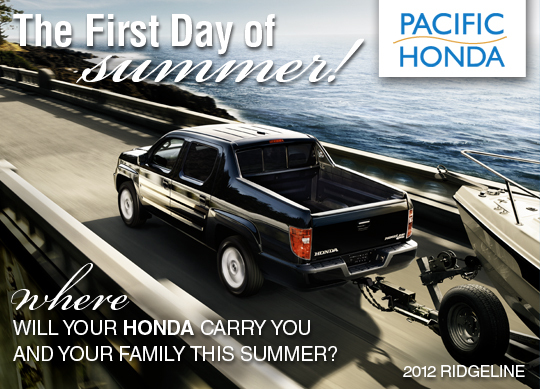 Here at Pacific Honda we are celebrating the First Day of Summer! We would love to know how you and your family plan to spend the summer. The beach? A roadtrip? Hiking? Relaxing by the pool? One of the most versatile Honda models on the lot is the 2012 Ridgeline. Come test drive a Ridgeline and find out how this adaptable vehicle can fit right into your family - whether it's soccer practice, towing your boat or just relaxing on the tailgate watching fireworks! Also, the Ridgeline was named a "2012 Top Safety Pick" by the Insurance Institute for Highway Safety (IIHS)! 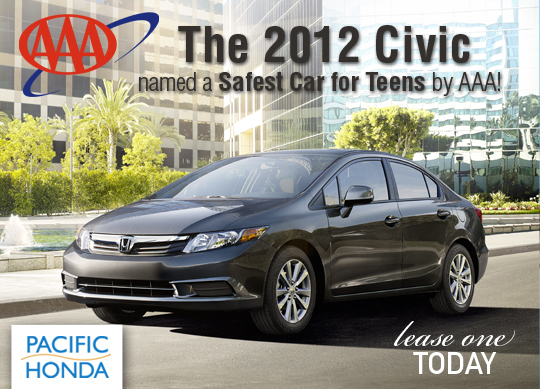 Civic named to Safest Teen Car List by AAA! In an article posted to MSNBC, the Honda Civic was named to AAA's list of Safest Cars for Teens. Come to Pacific Honda today to check out all of the lease options on Civic models! 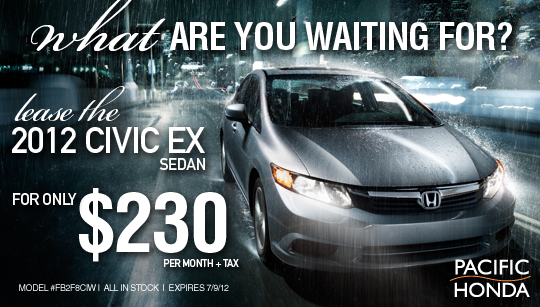 Lease a 2012 Civic EX Sedan today! Lease a NEW 2012 Honda Civic Sedan EX Automatic! For more lease details visit Pacific Honda today. Click HERE to find out more about this or other Civic models. 2013 Honda Fit Receives Highest EPA Fuel Rating! The 2013 Honda Fit EV, with a combined adjusted Environmental Protection Agency (EPA) mile-per-gallon-equivalency rating of 118 MPGe, received the highest fuel-efficiency rating ever given by the EPA. 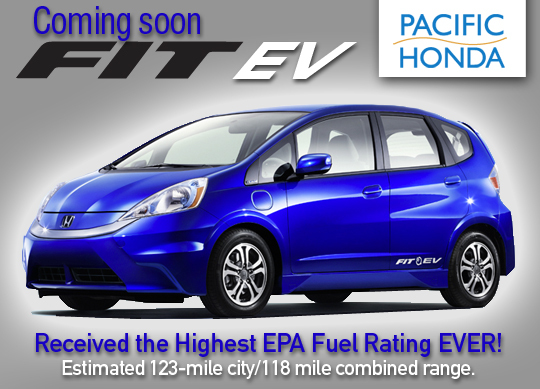 Is the Fit EV for you? Complete the EV Readiness Assessment to find out. 132/105/118 city/highway/combined miles per gallon of gasoline-equivalent (MPGe) rating; 82 mile combined (city/highway) driving range rating (adjusted). Ratings determined by EPA. Your MPGe and range will vary depending on driving conditions, how you drive and maintain your vehicle, battery age/condition, and other factors. For additional information about EPA ratings, visit http://www.fueleconomy.gov/feg/label/learn-more-electric-label.shtml. How Much is Too Much to Pay for Gasoline? Please watch this video from Honda and let us know what you think in the comments below. What do you think will fuel cars of the future? Do you know any fuel conserving driving tips? Do rising gas prices make you think of driving a more fuel efficient car? At Pacific Honda, we have vehicles like the Honda Fit (rated at 33MPG Highway), Civic Natural Gas that is rated at 38MPG Highway and the Insight Hybrid, rated at 44MPG Highway. Stop by Pacific Honda to test drive our lineup of fuel-efficient vehicles today! We’re excited to announce the launch of our “Right Price” pricing. We’ve combined real market based pricing analysis from San Diego and Orange County that is accurate and trustworthy. We calculate, analyze, then price our vehicles accordingly. 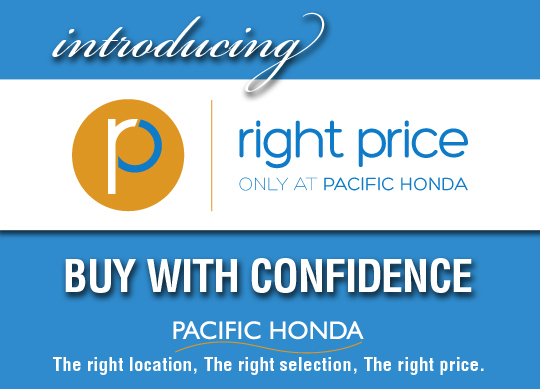 This gives you confidence knowing that Pacific Honda is the right dealership, with the right selection and most of all, the right price. Plus, all of this is backed by our Price Assurance Guarantee, Exclusive PAC Plus Ownership Loyalty Program and award winning customer service & parts. Simply put... we believe that we’re your smartest choice for Hondas in Southern California, and for the last 28 years, thousands of happy customers agree.